When people see embroidery, even the simplest design, on a piece of wood, they always seem to be more impressed than they are when looking at complex, time-consuming embroidery. Why is that? Most likely it's because people have a basic understanding of how embroidery works: needle and thread passing through fabric. But how do you get a needle and thread through a piece of wood? The answer is a lot easier than you'd expect. In fact, it's a lot like embroidering on paper, just with a little more effort. Simple patterns are easier when stitching on wood, so it's best to start small, then work your way up to more complex designs. The biggest challenge to intricate work is that the holes you make can't be too close together, which means the stitches can't be too small or too close together. Now, let's get ready to stitch! There are a couple of ways that you can transfer your pattern onto the wood. For both, have a push pin handy to mark where the stitching holes will be. Plan to space the holes at least 1/8" apart, but 1/4" is safer. For simple patterns, print the design on regular paper and lay the paper on the wood. Use a push pin to make a small indent at each place where a stitch will need to go through. In the photo shown above, each end of a line segment and intersection is marked. 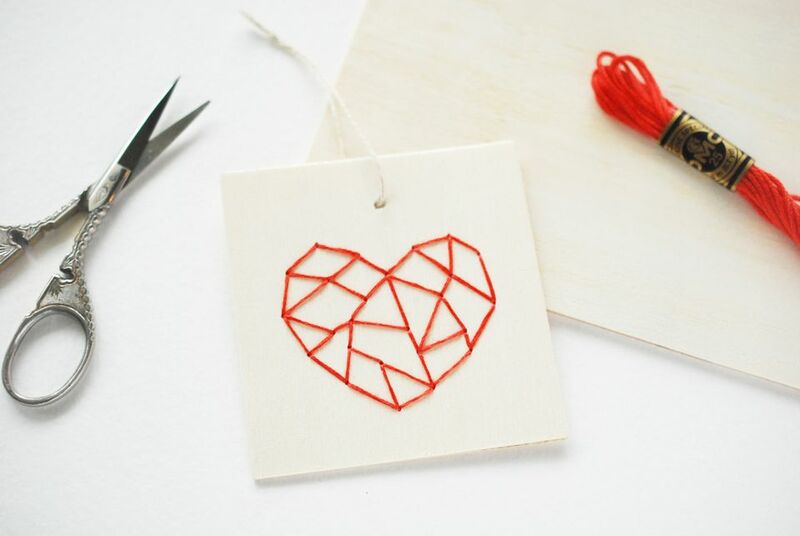 The geometric heart is from the free geometric Christmas pattern set. Take care to not let the paper pattern shift as you work. When you're finished, lift off the paper and you'll see the indents that mark out the pattern. You won't see the stitching lines, however, so refer to the pattern for that. The transfer paper method will work for just about any design. Place the transfer paper face down on the wood. Lay the printed pattern on top and trace over the design with a stylus or empty ballpoint pen. Lift away the paper and you'll see the outline of the pattern. From here, you may find it helpful to use a push pin to mark where each stitch hole should be. The craft wood section at hobby and craft stores offers a variety of products that are perfect for stitching on, as they are pretty much finished and smooth. Slices of tree branches (and even tree trunks) can be used too. Depending on what kind of wood you'll be stitching on and the look you want to achieve, there are several ways to make the holes you'll stitch through. Ideally, it's best to stitch through pieces that are 1" thick or less. A cordless drill with a 1/16-inch bit is the easiest way to make stitching holes. You will need to hold the piece firmly while keeping the underside of the wood open so you don't make holes in things you don't want to. Lay the board or wooden object on the edge of a counter (or a step as pictured above!) and hold it in place. Drill the stitching holes at each place where you have marked. If you don't have a drill, you can use a hammer and a small nail. For this method, lay the marked piece on a piece of scrap wood or several layers of cardboard. Then hammer through at each marked point. Be careful to go through the wood, but not too far. Remove the nail and continue onto the next hole. For a bold effect with larger stitching holes, use a punching tool like a Crop-a-Dile to punch the holes. Just line up the marked indents with the punch. This method is ​best for the simplest of designs, as the result will come out looking similar to lacing cards for kids. But don't let that stop you from making a project suitable for an adult. Just choose a modern design and stitch with thicker threads, yarn or ribbon. Thin balsa wood is soft and a push pin will go right through the wood. For this method, place the balsa on an old magazine or newspaper, and then poke through each indent. Sometimes twisting and wiggling the pin helps. You may also be able to make the holes by holding the balsa in your hand, supporting it from behind with your fingers. Just take care not to poke your fingers or crack the balsa as it is fairly delicate. Choose your thread or number of strands based on how large the holes are, or consider making the holes larger. Conditioning your floss with Thread Heaven is also helpful, as it protects the thread some as you pull it through the rough surface. Begin stitching through the pre-made holes. You may start with a knot, but often knots will pull right through, so it's best to use other starting methods. Flip the piece over to see the hole from the back, then flip it to the front to go back through the wood. Continue working this way, flipping it back and forth as you stitch. When you've finished stitching the design, check to see if any markings are still showing. If they are, carefully remove them with a soft pencil eraser. If you want to cover the back of your work, you can use craft glue adhere a piece of fabric to the back. Just remember that it will be permanent! After you've stitched your first embroidered piece on wood, you'll be ready to move onto more complicated designs. But at any point along the way, you're sure to impress your friends with your new skill!